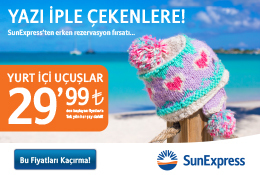 With summer just around the corner, tourism managers in Antalya have started coming up with new activities to draw tourists to the area for its beautiful beaches and historic sites. In line with their efforts, a shopping mall in the city introduced an exciting new dining experience earlier this week. Thanks to a sturdy crane, 180 visitors have had the chance to dine while suspended 60 meters (197 feet) in the air. 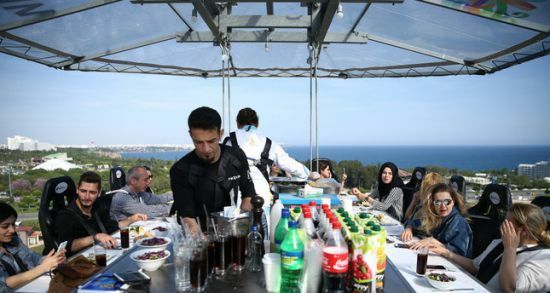 Organized for the first time in Antalya, the "Dinner in the Sky" event not only entertained the visiting diners but also the people on the ground. Ali Rafet Göçer, one of the participants, admitting that eating 60 meters up can be a little bit scary, recommending that those who participate refrain from looking down while dining. However, he said the experience was definitely worth it and added: "It was hard to concentrate on the dinner, but it was a fantastic feeling. The height really got my blood flowing." In each session, 22 people are given the chance to eat at a table suspended by a crane high above the ground. For those interested in this unique opportunity, the event will continue throughout summer.